Thirty minutes north of Drumheller you’ll find a small sign that almost blends in with the usual, side-of-the-road scenery as you’re driving. It’s a sign that promises to take you back in time. You might be intrigued, you might even have made a note to yourself to stop on the way back from your destination, or the next time around, and maybe you’ve even stopped to explore. If you’ve done anything but the last option – you’re going to want to add this destination to your list when it comes to summer exploring in Alberta. Our children have a hankering to explore all things abandoned (hello, childhood dreams crafted from urban exploration videos on Youtube). For that reason, and due to the fact that we were an hour early for our destination, a sleepover at the Royal Tyrrell Museum, we made the decision to follow the road, and to step back in time. 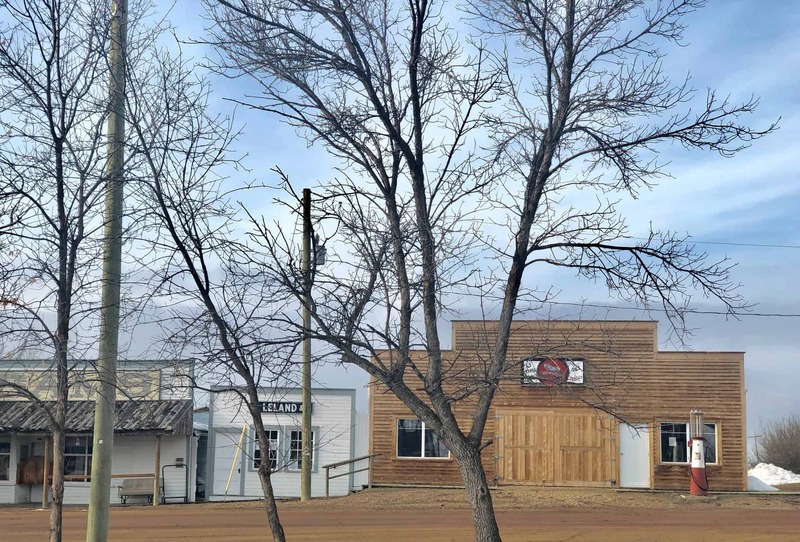 Though Rowley bills itself as a ghost turn, there are actually a handful of people living in the tiny town North of Drumheller. These people are responsible for creating the Saturday fundraiser: Pizza Night. Bring cash, pizzas can be paid with cash only. Pizzas are $14.00 for a 12″, two-topping pizza (extra toppings $1). Refreshments are served in the Saloon and range from cheap beer to cheap beer. You can stay the night, camp – but be warned that it’s first come, first serve, when it comes to the campground, and specific places that you can set-up camp. Visiting during the summer has its perks. There are free tours between 10 am – 6 pm every day throughout July and August – we can’t wait to explore the inside of the buildings at Rowley, as we’ve already explored the outside of them! With a minimal footprint on social media and little to no advertising about Pizza night, camping or even the abandoned and staged ghost town itself, Rowley is one of those adventures that you’ll be thankful that you took a turn to explore. You can learn more about the town, and stay up to date on local events by following the Community Association on Facebook.